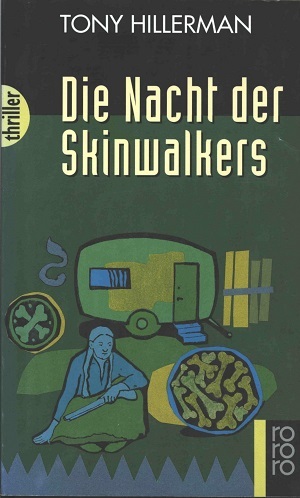 This is the 1997 German edition of Skinwalkers, Tony Hillerman's seventh Navajo Mystery novel. This edition was published by Rowholt Taschenbuch Verlag GmbH in Hamburg, Germany and is a part of the RoRoRo Paperback Thriller series. The text was translated into German by Klaus Fröba, and the title directly translates to "The Night of the Skinwalkers". The cover was designed by Walter Hellman and illustrated by Britta Lembke. The illustration features a woman with a gun sitting on the ground outside a trailer with a collection of bones nearby. Format: Paperback, 19 x11.5 cm.